Trouble in Okinawa could have serious repercussions for the Japan-U.S. alliance. In Okinawa, where the central government is trying to relocate the U.S. Marine Corps’ Futenma Air Station to the Henoko district in Nago, there is brewing discontent that could sour U.S.-Japan relations if not handled carefully. Okinawa Governor Takeshi Onaga won the gubernatorial election last November on a strongly anti-relocation platform. Many Okinawans do not want the relocation within Okinawa, because they believe that the burden of hosting U.S. forces should be spread more evenly within Japan – or that it should at least be reduced in Okinawa. There has been a lot of pressure on Onaga by his supporters to take concrete steps to stop the relocation project. Last Monday, Onaga instructed the Defense Ministry to suspend underwater work after discovering coral reefs damaged by concrete blocks used to conduct boring surveys. He threatened to rescind the prefectural government’s approval if work did not stop within a week. Okinawa and the central government hold different views on whether the prefectural government’s permission was required or not to place the concrete blocks where they were, and whether the previous governor’s approval was legitimate or not. Last Tuesday, the Defense Ministry continued their work on underwater surveys despite Onaga’s instructions. The Defense Ministry has also asked for the fisheries minister, Yoshimasa Hayashi, to make a decision on the validity of Onaga’s directive. A week after Onaga’s first instructions, Hayashi decided to overturn the work-stoppage, at least temporarily. He said at a press conference, “After taking into account both [the claims by the Defense Ministry and the governor], I made a decision on the matter. The Okinawa prefectural government’s instruction will be suspended.” A written statement that explained the temporary suspension of Onaga’s orders, which will allow work to continue at the site, read, “Halting the ongoing work will result in grave and irreparable damage, such as damage caused by the continued risk of accidents and noise pollution and an adverse impact on the relationship of trust between Japan and the United States.” A full deliberation on the Defense Ministry’s request for nullification will begin now; it be a few months before a final decision is reached. Hayashi’s jurisdiction over the administrative matter is based on the Protection of Fishery Resources Law. Onaga has responded to Hayashi’s statement, saying, “It’s hard to believe the decision was made fairly and neutrally. It’s truly disappointing.” The impasse between Okinawa and Tokyo is now likely to go to court. 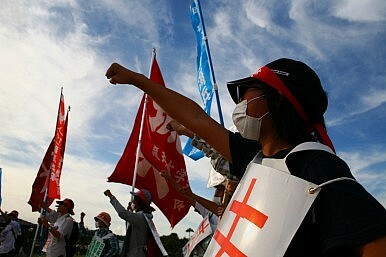 The U.S. supports the central government’s determination to continue construction work despite Onaga’s obstructionism. Marie Harf, deputy spokesperson at the U.S. State Department, emphasized that relocation is a goal that the U.S. and Japanese governments have been working toward and invested significant time and effort into. Relocation is a critical step to realign U.S. forces stationed in Okinawa, Harf said. Though the U.S. has stood firm behind the need to relocate the base to Henoko, recent complications will most likely be one of the issues that U.S. Secretary of Defense Ashton Carter will discuss when he makes his first visit to Japan next month.